Last night’s episode of “Who Do You Think You Are?” had most viewers bawling by the end. Christina Applegate’s father never knew his mother, believing she had died young under brutal circumstances. The truth was much more complicated and poignant. By the end of the episode, a seventy year-old man finally knew where he came from. Why was Robert told such a dreadful story about how his mother died? Was he really told she was dead 6 years before she actually died? Why did Robert believe he was older than he was? Why did Lavina’s sister, Delilah, die so young, and did she leave children? When did Lavina marry Walton, and was that when Robert stopped living with her? What other records can trace the family’s “descent” during the Depression? Why did Lavina become an alcoholic? Did it run in the family? Was she that affected by the downturn in her family’s circumstances? How did Paul & Lavina’s backgrounds compare? Would they have considered themselves social equals? Who is the half-brother mentioned in Lavina’s obit, and does he have descendants who remember family events from the 30s/40s/50s? Why was Lavina’s mother buried separately from her husband and daughters? 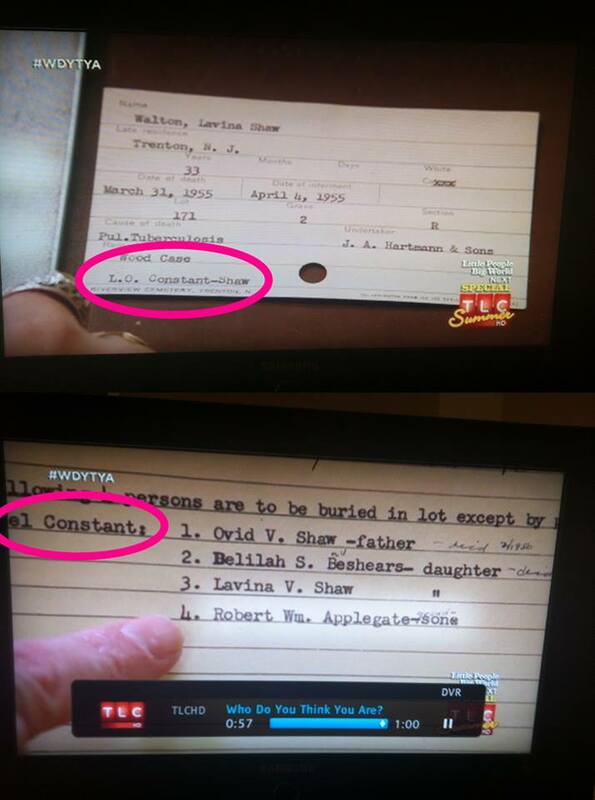 Most of all, why was Michael Constant’s name on the cemetery records for the Shaw family?! We just watched this online at our house today, and the Michael Constant issue was driving us nuts! As emotional as it was for them, this is worthy of another episode. It’s absolutely fascinating, even when the news isn’t always so great. Yeah, the Michael Constant thing is driving me nuts too. Obviously he must have played some significant role in Lavina’s life!!! I’ve done a little research on Michael Constant. He was born in 1905 as Michael Konstantynowicz (the 3rd I believe), so was about 16 years older than Lavina. He spent quite a bit of time in trouble with the law in the mid-late 1930’s, involved in gambling and ‘running numbers’, which would put him in his late 20’s early 30’s at the time. He was living with his parents during all of this on Princeton avenue in Trenton. He served some jail time around 1934/1935. Criminal activities are no longer mentioned in the papers after about 1938. He was buying property in the 1940’s (nothing fancy, just making investments in houses). He married at some point (Marie), and had a daughter born around 1952. He appears to have gotten divorced around 1957/1958. He died in March 1961. I wish they showed more of that index card from Lavina’s burial record. It is fascinating that there was a connection for so many years. What does the “L. O.” mean. Did he perhaps pay for the plot for Lavina when her father died in 1950? (Lavina’s father was buried there in 1950, but Lavina’s mother was not listed on the card (died in 1946, buried in same cemetery, perhaps nearby). You discovered a lot! I saw some of those articles as well at Genealogy Bank, but you went much deeper. Given the age difference, I wonder if they were family friends in some way? It seems very possible he was Lavina’s lover (if you pause the episode to read the full pages of the court documents they show, the Paul Applegate’s accusations are pretty detailed). But I wonder if he had reason to feel a paternal attitude towards her or sympathy to her whole family. I wonder if by comparing addresses if they were neighbors? I’ve traced down Michael Constants daughter Mary, but am not sure if its appropriate to write to them. I’m thinking I won’t. I would forward the information to Christina A if I knew where to post it to her. That way if she were interested in contacting them… she could. Well, I’m going to follow your lead and look at other documents shown on the video. Another thing I noticed is that Paul Applegate and Lavina lived near each other growing up. He grew up at 513 (if i remember right) Market, and she grew up at 522. Nice work — I did notice on the other Cemetery card, Michael Constant’s full name and another Shaw was listed. You could always tweet Christina Applegate who already has asked the Twitter-verse for more help in fleshing out her story. There’s another weird thing. If you look at the death certificate it says Lavina Walton’s father was Victor Shaw not Ovid Shaw. The obit days Victor Shaw was her half brother. So looks like a mistake on the certificate but Victor would be another relative to track down. I notice on the L.O. card that it’s “Constant-Shaw”. So wouldn’t that mean that this could be a half-brother of Lavina that she didn’t know about? It’s possible that Ovid had an illegitimate child childand he’s hyphenated the name. After all, she says during divorce proceedings that she has never lived with anyone with that name. Perhaps the lot was owned by two people, one named Constant and one named Shaw. Business partners? Need to know more about Ovid/Victor Shaw and the Shaw family’s business.